It maybe dizzy to manage multiple email addresses on your own.And want to check each and every one's inbox for new mails. 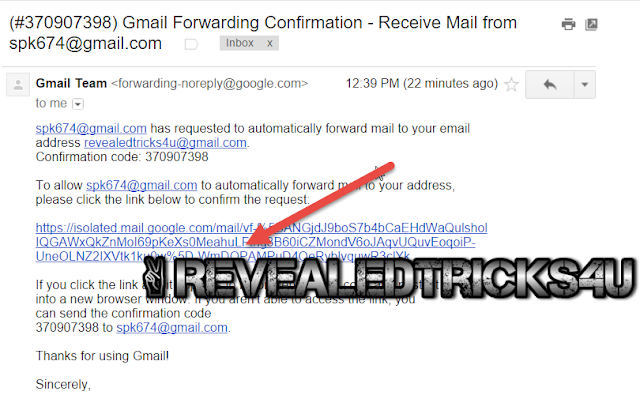 Aah,its a lot of time waste.So here it is,in RevealedTricks4U,I am gonna share you a trick that can make multiple email addresses into one single email.So that you can solve the problem of wandering throughout your multiple inbox. Steps on How to Auto Forward mails in Gmail to Other email address you own. 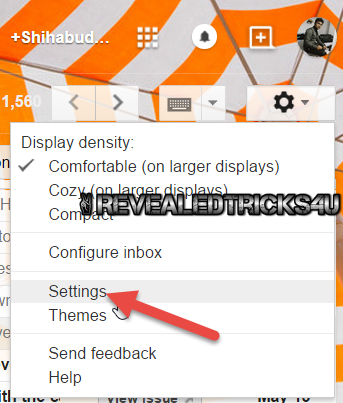 Login to Gmail and Go to the top right corner of the page(after logged in) and press settings icon and click Settings. Now go and click Forwarding and POP/IMAP in your settings window and click Add a forwarding address. Click Next and then Click Proceed until you see a confirmation box. Click OK and Log on to the other email address in a new tab or new window for verification purpose.In my case it is [email protected],i have to log on to.In your inbox you can see a new Mail like this.Click on that new mail. Click on that verification link to finalize the verification process. If you can't click that link.Please copy the confirmation code and paste it on the previously opened window or tab to complete the verification process. Now go to the previously opened tab or window(that is the from the email address that you have sent the verification request). Now scroll down to the end of the page and Click Save Changes. If all gone well,you can see a 7 days notification like this on the top of the Gmail logged in page. That's it now you will get any emails to your forwarded email address.In this case i am now getting all emails from [email protected] to [email protected] auto magically. Feel free to ask any question through the comment box or any. Sharing is a good habit.